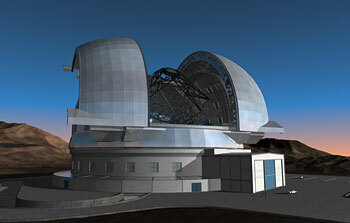 18 December 2008: High in the Atacama region in northern Chile, one of the world's most advanced telescopes has just passed a major milestone. The first of many state-of-the-art antennas has just been handed over to the Atacama Large Millimeter/submillimeter Array (ALMA) project. 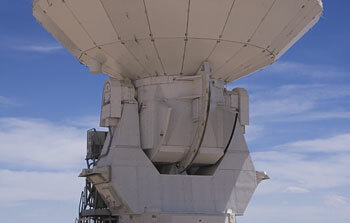 ALMA is under construction on the plateau of Chajnantor, at an altitude of 5000 m. The telescope is being built by a global partnership, including ESO as the European partner. 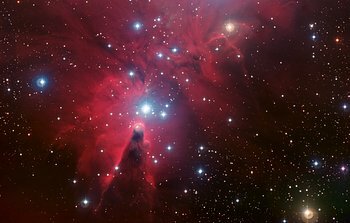 16 December 2008: The festive season has arrived for astronomers at the European Southern Observatory (ESO) in the form of this dramatic new image. It shows the swirling gas around the region known as NGC 2264 — an area of sky that includes the sparkling blue baubles of the Christmas Tree star cluster. 4 December 2008: Three undergraduate students, from Leiden University in the Netherlands, have discovered an extrasolar planet. The extraordinary find, which turned up during their research project, is about five times as massive as Jupiter. This is also the first planet discovered orbiting a fast-rotating hot star. 2 December 2008: Omega Centauri is one of the finest jewels of the southern hemisphere night sky, as ESO's latest stunning image beautifully illustrates. 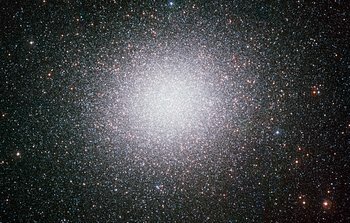 Containing millions of stars, this globular cluster is located roughly 17 000 light-years from Earth in the constellation of Centaurus. 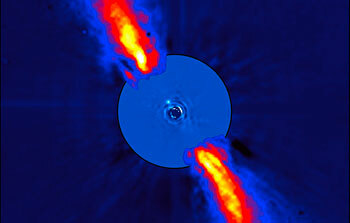 21 November 2008: A team of French astronomers using ESO's Very Large Telescope have discovered an object located very close to the star Beta Pictoris, and which apparently lies inside its disc. With a projected distance from the star of only 8 times the Earth-Sun distance, this object is most likely the giant planet suspected from the peculiar shape of the disc and the previously observed infall of comets onto the star. 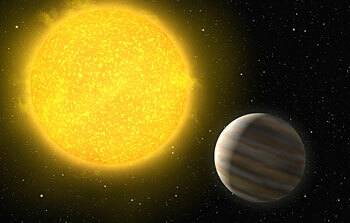 It would then be the first image of a planet that is as close to its host star as Saturn is to the Sun. 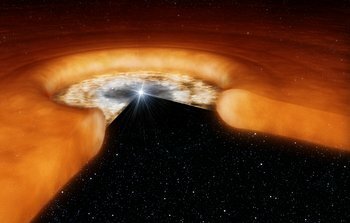 18 November 2008: Astronomers have used two different telescopes simultaneously to study the violent flares from the supermassive black hole in the centre of the Milky Way. They have detected outbursts from this region, known as Sagittarius A*, which reveal material being stretched out as it orbits in the intense gravity close to the central black hole. 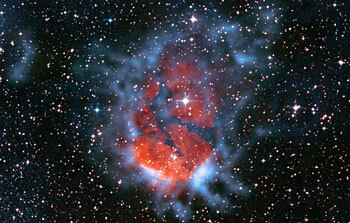 11 November 2008: Illustrating the power of submillimetre-wavelength astronomy, an APEX image reveals how an expanding bubble of ionised gas about ten light-years across is causing the surrounding material to collapse into dense clumps that are the birthplaces of new stars. 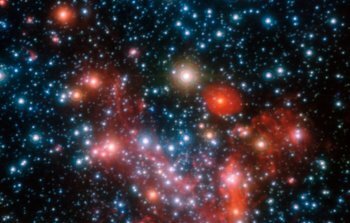 Submillimetre light is the key to revealing some of the coldest material in the Universe, such as these cold, dense clouds. 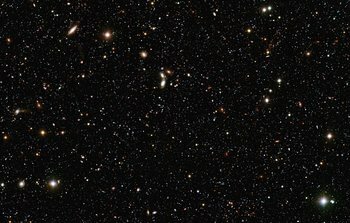 7 November 2008: Anyone who has wondered what it might be like to dive into a pool of millions of distant galaxies of different shapes and colours, will enjoy the latest image released by ESO. 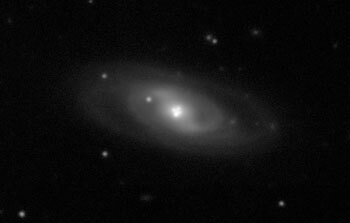 Obtained in part with the Very Large Telescope, the image is the deepest ground-based U-band image of the Universe ever obtained. 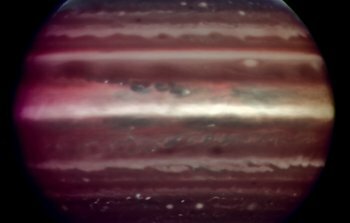 It contains more than 27 million pixels and is the result of 55 hours of observations with the VIMOS instrument. 30 October 2008: The 22nd James Bond adventure is due for release tomorrow, 31 October 2008, in the UK and a week later in the rest of the world. 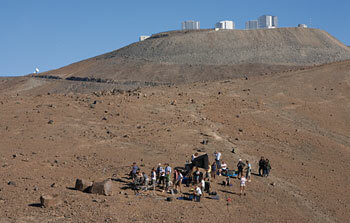 A key location in the movie is the Residencia, the hotel for astronomers and staff at ESO's Paranal Observatory. 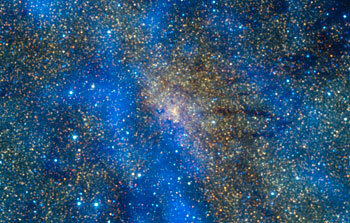 21 October 2008: A new image released by ESO shows the amazing intricacies of a vast stellar nursery, which goes by the name of Gum 29. 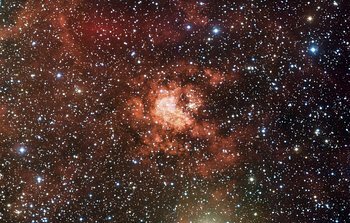 In the centre, a small cluster of stars — called Westerlund 2 — has been found to be the home of one of the most massive double star systems known to astronomers. 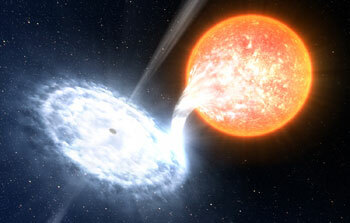 15 October 2008: Unique observations of the flickering light from the surroundings of two black holes provide new insights into the colossal energy that flows at their hearts. 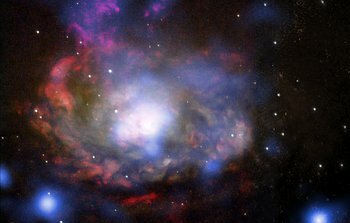 By mapping out how well the variations in visible light match those in X-rays on very short timescales, astronomers have shown that magnetic fields must play a crucial role in the way black holes swallow matter. 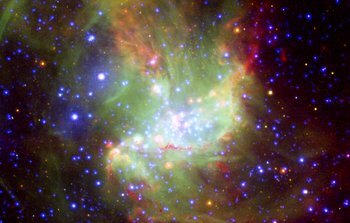 8 October 2008: Telescopes on the ground and in space have teamed up to compose a colourful image that offers a fresh look at the history of the star-studded region NGC 346. This new, ethereal portrait, in which different wavelengths of light swirl together like watercolours, reveals new information about how stars form. 23 September 2008: Astronomers have discovered a most bizarre celestial object that emitted 40 visible-light flashes before disappearing again. 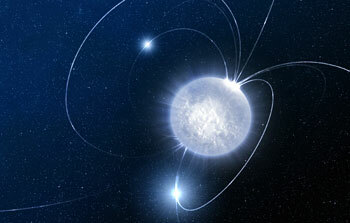 It is most likely to be a missing link in the family of neutron stars, the first case of an object with an amazingly powerful magnetic field that showed some brief, strong visible-light activity. 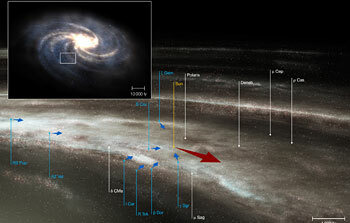 19 September 2008: New, very precise measurements have shown that the rotation of the Milky Way is simpler than previously thought. A remarkable result from the most successful ESO instrument HARPS, shows that a much debated, apparent 'fall' of neighbourhood Cepheid stars towards our Sun stems from an intrinsic property of the Cepheids themselves.